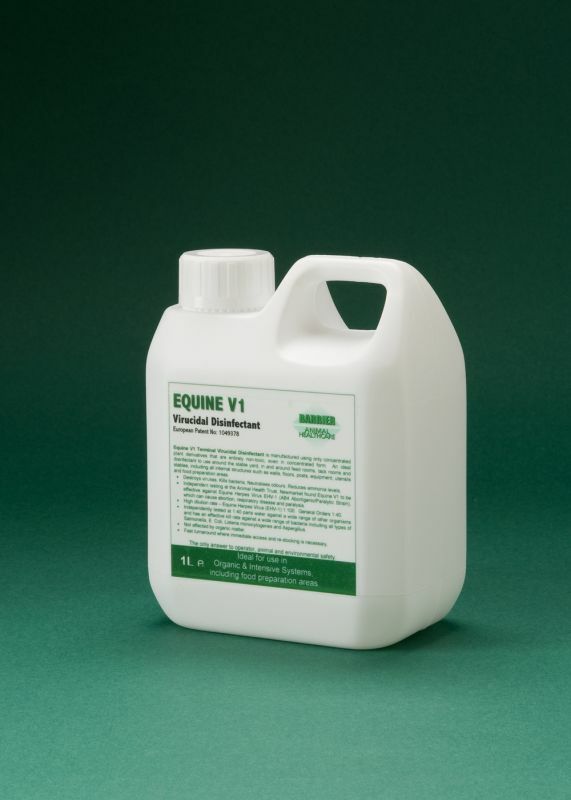 A truly unique 100% natural Virucidal Terminal Disinfectant that is entirely non-toxic, even in concentrated form. Ideal to use around the stable yard, in and around feed rooms, tack rooms and stables, including all internal structures such as walls, floors, posts, equipment, utensils and food preparation areas. Especially effective against EHV-1 (AB4 Abortigenic/Paralytic Strain). Destroys viruses, kills bacteria, neutralises odours and reduces ammonia levels. High dilution 1:100 parts water for EHV-1 and 1:40 parts water for general orders. Uses: Developed for use in organic and intensive systems including food preparation areas. The only answer to operator, animal and environmental safety. Suitable for Organic Farming Systems: This product falls into the exempt category of products which use only plant oils as active ingredients, as listed in Annexe IIB (Pesticides) of Council Regulation (EEC) No 2092/91 (as amended) and can therefore be used in organic systems. Destroys: Destroys viruses, kills bacteria, neutralises odours, reduces ammonia levels and is not affected by organic matter.